Ttaulman3D has released another high strength material. One for those users that print mostly with PLA or lower temperature 3D Printers. This new material is called t-glase (tee glass) short for tough glass. Strength - Specifications on the strength of t-glase will be posted as soon as the data is returned from the test labs. We have started using a local test lab along with the lab's at a few universities to accumulate data. The process involves printing several "test bars" These are bars printed at 5" x .5" x .25". The setup for printing these is 1 perimeter and 100% solid layers. Temperature - Optimum temperature is about 212c to 224C, but will print down to 207C and up to about 235C. NOTE: A feature of t-glase was to select a polymer that easily sticks to heated acrylic and glass print tables for the smoothest bottom surface possible. While t-glase meets this requirement, it results in a low glass transition temperature. The effects of a low TG is that parts printed in t-glase, should not be exposed to high temperature use or applications. The measured TG of t-glase is 78C. FDA approved t-glase is specifically made of FDA approved polymers for direct food contact/containers. This includes cups and other liquid storage parts as well as utensils. We are working with the chemical company to provide you with FDA related documentation so you may sell your printed parts that meet FDA requirements. These documents will be posted below when available. Environmental - While t-glase is not biodegradable like PLA, it is a material thats considered 100% reclaimable. Thus the new struders that convert failed prints back to usable line work perfectly with t-glase. If you have a struder, you can actually mix in 12% of the total weight in discarded clear water bottles. Please keep in mind, that the polymer used in most water bottles, has a slightly higher melt temp and that adding them to the mix, may increase print temp a few degrees. Clarity t-glase is considered colorless per industrial classifications. t-glase is considered "water clear" as it will not degrade to a color in multiple layters of applied thickness. t-glases clarity supports industrys requirements for non-destructive evaluation of 3D Printed parts. 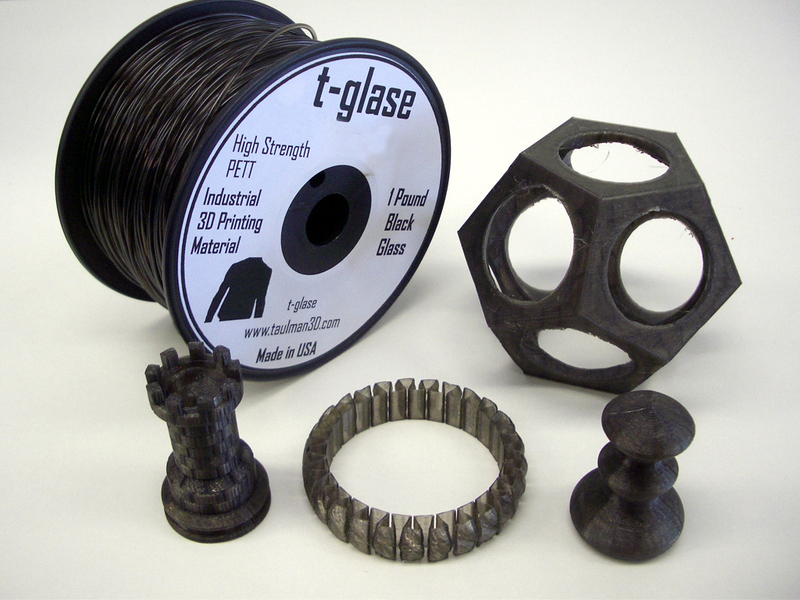 t-glase is very strong, yet different from our nylons as its stiff, like PLA and ABS. And based on our first industrial trials, meets all the requirements for the three industrial customers that had an applicable need. To these customers, the clarity was a significant advantage for their quality control departments. First, t-glase is made from the highest optical quality PETT material and is currently only available from two chemical plants. Unlike other polymers, some PETT, including t-glase are not considered transparent. Instead, it belongs to a group of polymers that are considered colorless and or colorless with a percentage of reflectivity. t-glase is also considered water-clear and optically correct. The term optically correct simply means that if you have a lens based die and injection mold precision reflective PETT into the die, the resulting lens will be relatively close to the same lens made from glass. While there is no formal definition of water-clear, in optical engineering, its a reference to how high quality plate glass seems to disappear when placed in water. When a clean piece of high quality glass is placed in water, the water negates the flat surfaces as a reflective surface, thus making the major surface invisible. However, the edges of the plate glass will still redirect or reflect light in a different direction, thus making them viewable even in water. This water-clear property is why some of products we buy are displayed in Blister-Pack packaging. The material is based on PETT with processing that bring out its reflective properties and enhances the visual presentation of the product. Over and above the problems associated with removing said product from the packaging!